The Business of the Year Awards recognize the businesses in Healdsburg that contribute to the quality of life for their employees and Healdsburg residents alike. These businesses add to the cultural and economic diversity that is shining a spotlight on Healdsburg as a great place to live and work. The 2nd annual Healdsburg Chamber Business of the Year Awards are scheduled for Friday, July 13th at the picnic ground at Villa Chanticleer. Our guest MC and Celebrity Host will be Leslie Sbrocco from the PBS Food Show “Check Please Bay Area!” Barbecue Dinner by Chef Ken Rochioli, Beer and Wine and a whole lot of Healdsburg fun will follow. Enjoy wines and beer from Hudson Street Wineries, Merriam Vineyards, Mueller Winery, Preston Farm and Winery, Rochioli Vineyards & Winery, Dry Creek Vineyard, Ferrari-Carano Vineyards & Winery, Pedroncelli Winery, Alexander Valley Vineyards, and Bear Republic Brewing Company. 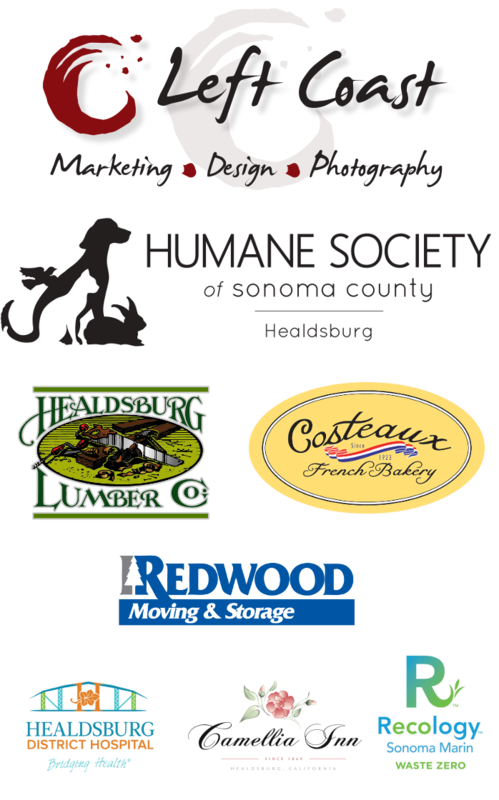 Become a Healdsburg Business of the Year Sponsor! No day of ticket sales.